Nothing compares to the relationship between a human and his dog. We talk to them, walk them, take them in the car, buy them toys, spoil them with treats and even call them our fur babies. Not Your Mother’s Book...On Dogs is a celebration of the love and friendship between man and canine. It is a look into how our lives are enriched, changed and challenged by our four legged furry friends. The Not Your Mother’s Book collection is a new anthology for a new century. Honest, funny, quirky and sometimes downright cheeky the creators Dahlyn McKowen and Ken McKowen, along with their team of co creators and contributing writers, take a no limit attitude when choosing and writing stories for this anthology. Refreshing, invigorating and sure to have you rolling on the floor in laughter, the Not Your Mother’s Book anthology is not for the light hearted. Not Your Mother’s Book...On Dogs takes a look at the dog world from pup to pampered pooch. There is the mischievous and naughty and those furry canines who just seem to hit the soft spot and welcome themselves into your life when you least expect it. The variety of dog stories provides balance, which is surely needed as the pain from laughter starts to take hold of the whole body. 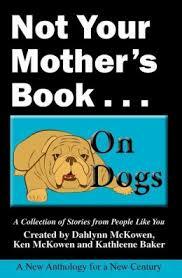 Not Your Mother’s Book...On Dogs does not disappoint but compliments the first few books in this anthology. I have read many previous writings by co creator Kathleene Baker and have always found her not only inspiring and uplifting but comical, invigorating and at times down right hilarious. I started Not Your Mother’s Book....On Dogs with interest, wondering if the character of Kathleene Baker would shine through, and I was not disappointed. With a love for dogs and fur babies of her own Dahlynn and Ken McKowen definitely made the right choice when they teamed with Kathleene Baker for On Dogs. Dog lovers world wide will not only relate to this book but will enjoy taking a trip down memory lane as they share the life adventures of the contributors and their dogs. Can you remember the first time your eyes gazed at that gentle longing look on your dogs face? Bobby Barbara Smith sure can as she recalls her experience in her story A Facebook Affair. Then there is Max, the wonder dog of Francine Baldwin-Billingslea who saved his owners life. Of course we have all experienced the love hate relationship between a dog and our partner, but maybe not as hilariously as Marnie Frances recalls in her story Love Me, Love My Dog. Not Your Mother’s Book...On Dogs is cleverly done and a credit to those who worked so hard to put it together. If you pick it up expecting it to just be another one of those dog saves human or how dogs enrich our lives books then you will be terribly disappoint. There is far more to this book than even the cover depicts. This is not just a collection of stories it is a doggone hilarious journey. Each page and each individual story carries through to the next. From front to back you are captivated and entertained. This book has given a positive and entertaining voice to the canine world. A place for them to share their experiences, through the eyes of mum and dad of course, and to show that really they rulethis world. I wish to express a special thank you to Hank Baker, the oldest fur baby of Kathleene Baker, for his wonderful bio and insight into Kathleene and his family. This is a book to be read for pleasure and celebration. You will want to share Not Your Mother’s Book....On Dogs with all the family.....fur babies too. I love your review! ♥ I'm actually looking for this as I want to buy a pet dog for my kid. thank you very much for the great insights. Thanks for dropping by, reading the review and taking the time to comment. Feedback is always appreciated. Jennifer.